Bobby Garland's Mo'Glo Jigheads are the perfect jighead for all your crappie fishing needs! These jigheads Glow-in-the-Dark and come in 5 fish catching colors. 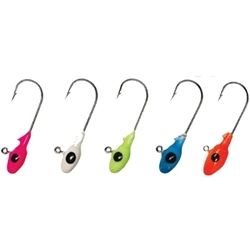 Just choose your color and weight then you are ready to rig up the perfect crappie fishing bait! 1/8oz BLUE IS NO LONGER AVAILABLE.